Marshall’s Chair interview with supermodel Olesya Senchenko, the founder and designer of swimwear line Skaya. Do you remember how you met Marshall? Tell me about it. O– I met Marshall a few years ago. I was looking for a hair stylist who I can trust not only with my hair but also with my life secrets. As everybody knows, a hair stylist is not only the person who does your hair but also your therapist. Upon our first meeting, I knew that he was right for me! His professionalism and his kind personality rise above any doubt! Since you’ve been seeing Marshall, what have you noticed about your hair? O– My hair became healthier from the roots to the ends! It became shinier and softer! It’s even growing much more quickly! Also it’s easy for me to maintain the same perfect hair style even when I don’t have time to see my Angel Marshall! Tell me a little about your modeling career. How did you start? What have you worked on? )-I started modeling when I was 16 years old. I won second place at the Beauty contest in Russia and that led me to sign a contract with my mother agency in Moscow. Then I went to Japan and Singapore, where I got great experience and the honor of appearing on covers of big magazines like Harper’s Bazaar, Marie Claire, and Elle. Then it was New York, Milan and Paris, where I got chance to work with famous designers including Prada, Ralph Lauren and Vera Wang. As a young model in New York by yourself, what has been the most challenging? O-The most challenging was to be away from my parents and to live in a country where I can hardly speak the same language! It’s hard to be without family support at such a young age! It’s hard to make big decisions and organize your life. You become mature very quickly because you understand it’s not time to be a baby and complain about things! How did you come up with your line Skaya? How do you describe Skaya swimwear? O-After modeling for 10 years, I chose to use my passion for fashion design by creating my own unique, velvet swimwear line, specifically designed to complement women of all body shapes and style preferences. Skaya swim line is inspired by my travels all around the world. From cheeky Brazil to classy and sophisticated France, Skaya swim has a design for fashionistas everywhere. A lot of brands are afraid to try new fabrics and designs, I tried to do something special with mine. Why cover your best parts when you could wear a suit that will define them? Best of all, while Skaya swimwear is durable enough to be worn around the pool or even in the ocean, their glamorous designs make them ideal for festivals and clubbing as well. O-I think that we all notice that some women don’t have a classic beauty type, but something in them is attractive. Something in their walk, their smile or in their eyes…this beauty doesn’t change with age. This is called charisma! It’s all about your personality and the way you treat yourself! If you could offer any advice to young aspiring models, what would it be? O– I think the best advice that I can give to a young model is to believe in yourself! It’s a very competitive business! Also, don’t take it as a joke, be professional, and work on yourself! And remember you are unique, there’s not another girl in the world like you. Is Going To Bed With Wet Hair Bad For You? Ever hear that going to bed with wet hair will make you sick? You’re not alone. It’s one of those pieces of old-school advice that gets passed down from generation to generation, along with the thought that plucking one gray hair causes three to grow back and that only teenagers get acne. Some people prefer to wash their hair at night for whatever reason—it fits with their schedule, they love that snooze button or they’ve been doing it for years without really thinking about it. But does going to bed with wet hair really, truly, actually make you sick? And even if it doesn’t, does it harm your hair? We went to the experts to find if the advice actually holds up—or not. Ask the Doctor: Will Going to Bed With Wet Hair Make You Sick? According to Amber Tully, MD, a family-medicine physician at Cleveland Clinic, the idea that sleeping with wet hair can cause illness is an old wives’ tale. (Sorry, mom.) The common cold—think sniffling, congestion or a runny nose—is caused by a virus that is in no way related to how damp or dry your hair is. “You may feel physically cold if you sleep with wet or damp hair, but this will not cause illness,” says Dr. Tully. But people associate being sick with feeling physically cold, she explains, which is probably why this mistake is so prevalent. The common cold is caused by a virus that is in no way related to how damp or dry your hair is. On the other hand, going to bed with wet hair can cause an entirely different set of issues—for your scalp. “A chronically damp or wet pillow may become a breeding ground for bacterial or fungal infections, since the combination of warmth and moisture allows many fungal elements to thrive,” says Dr. Tully. That could result in seborrheic dermatitis—a.k.a. dandruff, the most obvious sign of which is a chronically red, itchy or flaky scalp. 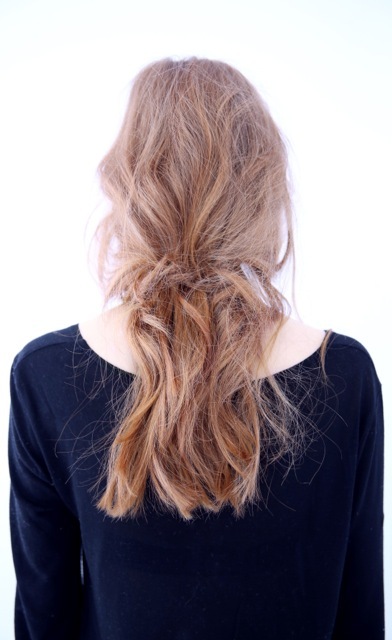 Ask the Hairstylist: Will Going to Bed With Wet Hair Damage Your Hair? Going to bed with wet hair can also create extra work in the AM. “Sleeping with wet hair causes your hair to set, which means your hair will turn out whichever way you sleep on it,” says Marshall Lin, a stylist at Frédéric Fekkai SoHo Salon. “Your hair can get tangled during sleep, and those knots can be harder to get out without causing breakage to strands.” He also seconds the point about damage to the scalp—noting that it’s not just your pillow that’s the problem. “The moisture, oil and body heat from your scalp can cause buildup and lead to dry scalp or dandruff,” he says. If you have no other options besides going to bed with wet hair, it’s worth taking a few extra steps to protect it. First, let your roots dry a little bit, which can help alleviate scalp issues. Then, “comb your hair well and apply a light, leave-in conditioner,” says Lin. “Since your hair will set overnight, you’ll want to go to sleep with it smooth and neat.” Lin recommends working Fekkai PrX Reparatives Leave-In Conditioner Spray through the mid-lengths to ends, which will help keep hair smooth. In the morning, comb your hair and quickly blast your roots with a hair dryer to ensure your scalp is completely dry. If your hair is wavy or curly, work a curl cream or oil through the ends—otherwise, you’re good to go. While hitting the sheets with wet hair won’t kill you, it’s generally not a good idea for your hair and scalp. If time is the enemy at bedtime, we recommend a quick dry using the ultra-fast Harry Josh Pro Tools hair dryer. You can also dry and protect your hair at the same time with a fast-absorbing hair turban (it’s comfy enough to wear while sleeping). And—most important—choose the right brush or comb to detangle your wet strands, while minimizing breakage. Try The Wet Brush, which is designed especially for wet or damp hair. Even though fashion model Thalita De Oliveira gets her hair done as part of work, she tells us why still goes to get pampered by Marshall. How long have you known Marshall? Since May 2008. That’s eight years now! We met at Frederic Fekkai. I asked my agency to make an appointment with Fekkai. Even though I get my hair done for work all the time, I still wanted to get the proper experience where I could sit down and relax. I really don’t like it when I have to get my hair cut on sets. People always think it’s so great to get your hair done as part of your job, but you know, it’s really never what you want. If you have a hairdresser that cuts your hair the way you like, it’s absolutely affects your everyday mood. You’re going to feel so pretty. What was that first experience you had with Marshall like? I can’t even describe the connection that I had with Marshall when I first met him. I was just so impressed with his vision and devotion to hair. He’s really a natural. Before I met him, my hair was always shoulder length, but I wanted to keep it longer, so I went to him, and he told me very confidently, “I’m going to make your hair grow. I’m going to cut your hair in the most beautiful way, such that you don’t need to get any trims and you can just focus on letting it grow.” I really saw my hair grow out beautifully, so I kept my relationship with him. I only need to get my hair cut twice a year now. All my friends started going to Marshall too. Now that you’ve been to Marshall so many times is the experience difference. Of course, it’s better, because now he’s my friend. My time with him is a magical time. Why is your hair so important to you? If my hair doesn’t look great, I won’t feel like walking out of the house – I won’t go to castings. It really dictates my mood. What was the worst hair disaster you’ve experienced? When I first started modeling at 14, I had a horrible haircut that made me stop modeling for a year. It was long in the front and short at the back, and I couldn’t look at myself. I learnt a lesson: even though it’s part of work, never let anyone do something to your hair unless you know what they are going to do to it. I’ve been declined big jobs because I didn’t want my hair to be cut, but that’s life. I don’t have much regrets. I left home at 13 and by 18 I was already very independent. As a mother, one thing I would say is to see yourself as your own child because there’s no one that you would care for more than your own kid. I first met Marshall last season during fashion week backstage at the Alice and Olivia show. Creating gorgeous bombshell Bardot inspired waves, he had nailed the cool eccentric vibe of Alice and Olivia. His personality was infectious and you could see a real artistry in his work. With over 2o years of industry experience, it’s his work with Fekkai (which began in 2003) that really set him on the map. Working today as the key hair stylist behind major industry shows and campaigns, he’s also known to quoff the hair of major Victoria’s Secret models and celebs on the red carpet (think Kate Bosworth and Olivia Palermo to name a few). We had a chance to chat with the Mane Master about the makings of a coveted career. I was just looking for summer work when I was about 15 years old (nearly twenty years ago) and a salon seemed like a cool place to work. I ended up falling in love with making people beautiful and creating a cool style. I’ll always remember one moment when was 16, I was drying someone’s hair and I was like, ‘I love this! I can do it for my whole life!’ It was like a calling from God. When I joined my present company [Fekkai], I needed to start assistant again after 10 years experience. There were many frustrations about ego, race, and fairness, but when you choose to do something, finish it and finish it good! I learned to be patient, how to communicate with people better, and to learn the business side of this industry. Challenge is like breaking a wall. It’s hard and sometimes painful, but after you’ll have better and bigger views. I’m a lucky person. I’ve learned so much by working with different talented people. One person is Anthony Mascolo. He has many salons, has created an education system to help a new generation of hairdressers, and he continues to work editorial. Everything he does is exactly what I dream to do it . Another is Kim Robinson from Hong Kong. I’ve never worked in a more competitive place. From the way I stand to the socks I wear, everything counts with her. It made me become not just a hair stylist, but an expensive, presentable hair stylist. The next is Michel Aleman. He made my work and specially my eye become a microscope. All the details, every angle, even every shadow, are perfectly precise. As a hair designer, I just keep on reaching for my favorite signature look each day. I never feel 100% satisfied about my work and I always feel like I can do better. I think that’s called perfection. If I’d have to pick a favorite moment it would be the hair I did for Kate Bosworth at the CFDA awards about 7 or 8 years ago. It was an updo and the texture was fizzy and dry but in perfect proportion. Back then, we really didn’t see a lot of frizz on the red carpet, so it was a good statement. I cut off Selita Ebanks hair. It’s wild to chop off a Victoria’s Secret Angel’s hair, but it came out awesome. She is my girl. She always gives me full trust. But I feel like every person who sits in my hair is major, not matter what kind of transformation that we do. The updo comb from Morrocanoil, Kasho shears, a Toni and Guy cutting comb, Oribe Dry Texture Spray, Oribe Strong Wax, and Fekkai Hair Refresher Dry Shampoo and Full Blown Volume Mousse. @maneaddicts, @thefatjewish, @georgiykot, and @sportlaugher (I like to mix it up and I like funny Instagrams). Ten years ago I was pretty sure and confident about all I did, but I would tell myself to eat healthier and on time. I have a huge stomach problem now. Young stylists often skip meals and never feel it, but if you want to continue your career over a long period of time, you need to take care of yourself. The best advice I’ve received and I will give is from the hairstylist who brought me in in this industry. His name is Frankie and he is an amazing hairstyle from Hong Kong. He said, ‘when you have choices, you can choose. But when you have no choices, don’t choose.’ This means you have to take whatever opportunity come to you for your work. Never say no. It’s not about only just saying yes, but grab what you can. When you are lucky enough to have many choices for work, then you have the freedom to choose. My advice for the new generation is to focus on what you can do, not on what you can be. We are in the industry where we can make things happen with hard work. No successful hairstylist sits back and waits for things to happen. Also, never stop learning or receiving new ideas. The day you stop learning is the day you’ve retired from this industry. Continuing to work harder and harder in every area. I want to create education, development for youth, new styles, making more and more people beautiful, and hopefully my work can inspire more people. Follow @marshalllinstyle for more #manespiration.